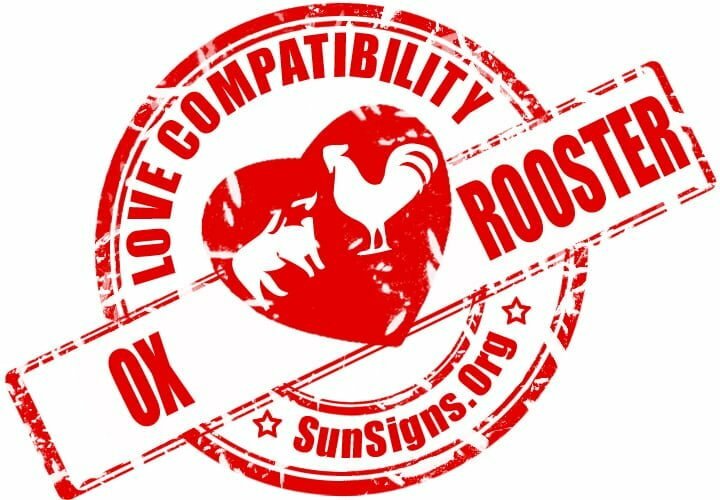 The ox and rooster relationship share excellent love compatibility in a romantic match. What causes them to fit so well together? Is it because their similarities and differences mesh so well? Will there be anything that can give these two issues? Will they always find a way to work through any problems they might encounter? These two Chinese astrology signs work great together, whether they are friendly or in a romantic relationship. They have comparable attitudes and beliefs. The differences these two have work together instead of against each other. The ox and the rooster compatibility is typically traditional. Additionally, they will both like using rational and logical ways of going about things rather than trying something too risky. The rooster likes having things just perfect and the ox enjoys this as they like having things done correctly the first time. These traits work well in any relationship, but very much so in a business relationship. When the Ox and Rooster are in love, they carry that same compatibility. They will both hold qualities like honesty and dependability in high regard. Because of this, the likelihood of either of them feeling envious or clingy is very low. When the Ox is dating a Rooster, their nature that typically leans toward being more reserved and solemn and slightly antisocial goes away. At that point, they will become more tender. Arguments are something they dislikes highly and avoid whenever possible. They want their domestic life to be peaceful and balanced. The rooster thrives on this, because they require peace and order to really bloom in a romantic relationship. They will be more likely to glorify romance and lovers. The Ox and Rooster in bed too are sexually compatible. The ox male is respectable though and will easily meet the female rooster’s high standards. The rooster man tends to be more sociable than the ox woman, but they can usually help the female ox come out of their shell and be more social. Seeing where it comes from, this might not cause any issues between them at all. The house the Ox man and Rooster woman share will always be pristine and even somewhat luxurious, no matter what type of marriage compatibility they share. In the Ox Rooster friendship, both know how to appreciate one another. The ox enjoys the rooster’s attentive nature. The rooster enjoys the ox’s diligent nature. Both of these Chinese zodiac signs will be efficient and detailed. They both enjoy having their intelligence stimulated. They both are detail-oriented and very capable. Chinese zodiac compatibility predicts that neither one takes criticism very hard. This is one of the things that makes the Ox Rooster soulmates a content couple. With these two being so alike, it is their shared traits that will keep them going strong. Their outlook and aspirations for their lasting ambitions will be shared. They will usually strive for achievements that are materialistic. Their differences can actually help them form a good, long-lasting relationship. The Ox Rooster breakup happens very rarely. The ox has a lot of stability and is shy, but has a noble nature. The male rooster will be a bit more noisy, friendly, and more direct. Their diligence and tendency to be responsible will attract the oxen. Ox & Rooster Chinese Horoscope Compatibility Rated 5 Hearts!